David James Skipper was born in North Carolina (apparently New Hanover County) on August 18, 1849. His father was Joseph W. Skipper and his mother was Susan Louisa Garnto. Only his maternal grandmother, Rebecca Garnto, is known of at this writing. In the early 1850s the Skippers moved from North Carolina to Tennessee and lived three or four years. Dave was just a little boy of 3 or 4 when they moved. Mary Catherine Dillon was born in Tennessee February 8, 1851 (but her tombstone says 1849). Her parents were James B. Dillon and Harriet Margaret Rogers. James was 32 years old and Harriet was 34. They had been married nine years and had three older children. James Dillon was the son of Joshua Dillon, Jr., who was born in South Carolina on November 10, 1773, and Mary Breeding. The Joshua Dillon family moved to Tennessee between 1810 and 1815 and James was born there in 1819. The Dillon family lived in Montgomery County and Joshua and Mary were buried there. They spelled their name “Dilling” most of the time. 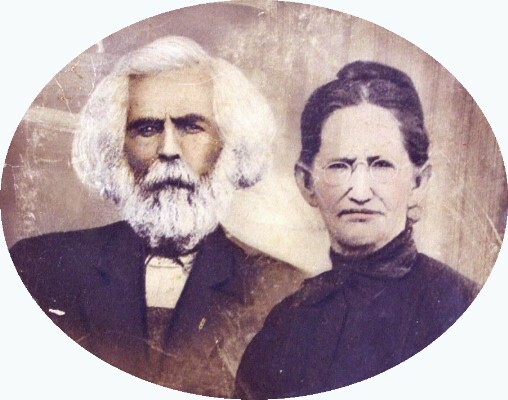 James and Harriet Dillon had another daughter two years after Mary Catherine and then they moved to Arkansas. It is interesting to speculate that Dave Skipper and his parents had lived in Montgomery County during their stay in Tennessee and had influenced the Dillons to make their move. It is even possible that the two families were acquainted back in the Carolinas back in the early 1800s. Whatever the case may be, David James (also known as Dave and 'Big Jim') came to Conway County with his parents at age 7. They had migrated west arriving in Conway County in late 1856, clearing virgin land for farming between Solgohachia and Lanty (See article on Joseph Skipper.) and both families were living in Washington Township, Conway County, Arkansas during the 1860 Census. Dave Skipper's age was listed as 10 and Mary's as nine. By 1868 Dave was 18 and Mary was 17. The exact date of their marriage isn't known, but their first child was born in 1869. According to the 1900 U.S. Census and family records, they had 10 children, 9 of whom lived to marry and have children of their own. The photographs of Dave and Mary were taken in about 1900 or a little earlier. Their 30th wedding anniversary would have been around 1898. Mary Florence, born September 20, 1869, married John Franklin Kriselll, died September 26, 1903. Buried at Lone Grove Cemetery. Harriet Lucretia, born September 1872, married James Franklin Lloyd, buried at Lone Grove. Louisa 'Lou' Rebecca, born December 13, 1874, married Andrew LaFayette Treece, died March 17, 1954, buried at Jonesboro, Ark. John Quincy, born February 27, 1877, married Mary Magdalene Sands and Martha Bradshew Bice, died April 17, 1931, buried at McLaren Cemetery, Lanty (see related article). Elizabeth 'Betty' Casandra, born July 10, 1879, married Sonnetia Harzona 'Nett' Cowan, died February 12, 1931, buried Lone Grove. James Arthur, born June 19, 1882 married Josephine Noland, died February 9, 1940, buried at England, Ark. David, born 1885, died at 18 months in 1886. Rosie Elmer, born August 21, 1887, married John W. Edwards, died February 12, 1974, buried at Gore1 Oklahoma. Carl Toby, born December 14, 1889, married Ida Octavia Treadwell, died September 21, 1950, buried, England, Ark.
. Ethel Pauline, born June 18, 1894, married James Phillip Turner, died February 10, 1957. buried at Gore, Oklahoma. Apparently all the children were born and reared on their parents’ farm. The entire Skipper land (including Dave’s father and two brothers) was at one time around 600 or more acres in the area around the prominent landmark south of Lanty that was called Skipper Mountain in the late 1800s. The mountain, a large dome shaped tree covered hill rising about 400 feet above the surrounding pasture land, is now called Round Mountain as all the Skippers have died or moved away. The farm was quite self-sustaining. Grandchildren can remember a large orchard, corn, cotton, and gardens. Also cows, pigs, chickens, and geese (for feather bedding). There were mules and horses, but Dave still liked to use oxen for draft animals. (A family story says that Theodore Roosevelt, passing through the area, had words of admiration for Dave’s oxen team.) The wool from Angora goats was spun and weaved into clothing and other textiles. (Some recall a high log bridge over a road for the goats to get from pasture to pasture.) There was a leather tanning vat and tools for making shoes, saddles, and other leather goods for farm use. There was a large blacksmith shop with a large bellows (that kids liked to ride up and down) for making and repairing equipment, including shoes for the oxen. Dave’s independence is reflected in a story told by a young Morrilton cotton buyer. When he was just starting out, he saw an old gray-bearded man coming into town with a bale of cotton on a wagon pulled by oxen. [Round mountain is about 10 miles from town.] The young buyer brashly ran and hopped onto the wagon, preparing to cut a sample from the bale. "Say, grandpa, how much you want for this cotton?" "Don’t cut my cotton, boy!" the old man replied. Next thing the young man knew, he was on the ground in the middle of the street nursing a knot on his head from the bull whip handle, the wagon continuing slowly down the street. He learned the hard way that Dave Skipper allowed no one to sample his cotton without his specific permission in advance. The buyer also learned to be more respectful of the local farmers. Another story relates how Dave once set a trap inside his corn crib thinking that raccoons were reaching through the logs. Next morning, he found a man trying to get his trapped hand back through the narrow space. Dave turned him loose, doctored his arm, fed him breakfast, and gave him a sack of corn, telling him not to steal but to ask for the corn if he was that desperate. The man never stole from him again. In the final year of the nineteenth century, Louisa Garnto Skipper was living with her son, David James Skipper, and his family in residence #17. They were the 17th family surveyed. Louisa had been the young wife of Joseph W. Skipper when they migrated from North Carolina through Tennessee to Conway County in the early 1850s. She had two daughters while they were in Tennessee. The 1900 Census list her age as 69 and her birth date as August 1830. Louisa was a widow and reported that she had had eleven children and that four of them were still living. Joseph died before the 1880 Census, probably in 1878. Louisa's mother, Rebecca Garnto, had come to Arkansas with Louisa and the family. Rebecca died after 1890 in her 80s. David James Skipper was Louisa's second son. 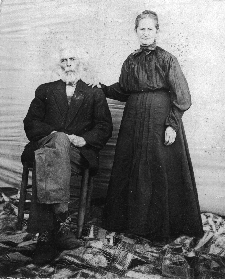 He and Mary Catherine Dillon had been married for 31 years. She had had ten children and nine were still living. Four were still living at home. Four daughters and one son were married and living on their own. The four children at home were my grandfather, James Arthur Skipper, who was 17 years old; Rosa Elmer Skipper, age 12; Carl Toby Skipper, age10; and Ethel Pauline Skipper, age five. Dave's younger brother, John W. Skipper, and his family lived in residence #28. John was listed as 48 years old although he was almost 49. He and Nancy had been married for 19 years and they had one son, Napoleon B. Skipper, who was 16 years old. John had been married before, but his first wife apparently had died at a young age. The young orphaned children of another Skipper brother, G. W., lived with John and Nancy. These children were Ira. N. Skipper, age 7; Ora M. Skipper, age 6; and Hobart C. Skipper age 3. Ira Skipper was born the same year as my Grandfather Luther Maxwell and both were school teachers in Conway County. G. W. Skipper was a prominent citizen in Conway County in the late 1800s and an article in the 1890 book of Arkansas citizens provides valuable family information that has replaced what has been lost in the burned 1890 Census. G. W. was born in 1860 after the family got to Conway County. I don't know what happened to him and his wife to cause the children to have to be placed with his older brother, John W. Skipper, but if he had died, it would have been in his 30s. Dave and Kate's four married daughters were Florence Krisell, Harriet Lucretia Lloyd, Louisa Rebecca Treece, and Elizabeth Casandra Cowan. Florence was 30 years old. She and John Franklin Krisell had been married for twelve years and had eight children ranging in age from one to eleven. More details about the children are on Florence's page. They lived in residence #4 and were the fourth family surveyed. John's father, Moses Krisell, live in residence five with a younger son, James A. Krisell. Moses was 63 and widowed. James was 17. Florence only lived four more years. Harriet was 27 years old. She and James Franklin Lloyd, 34, had been married for twelve years and they had had six children but only five were living. Harriet is the daughter who had to have a parental permission slip to get married at such a young age. They lived in residence #16 near her parents, Dave and Kate. Harriet had two daughters and three sons ranging in age from one to eleven. More details of the family are on Harriet's page. There is a page for each daughter. Lou was 25 years old. She and Andrew LaFayette Treece had been married for three years and had two children, Russell A. Treece, age one, and Almah, age two months. They lived in residence #27. Andrew did the McLaren Township census in early June. Some of this was done on June 4th. Betty was a month short of her 21st birthday. She and Sonnetia Harzona Cowan had been married for three years and had two sons, Leon, who was two years old, and Leonard, who was five months. They lived in residence #1 and were the first family surveyed in McLaren Township. Their brother John Quincy Skipper was 23 years old. He was born between Lou and Betty. 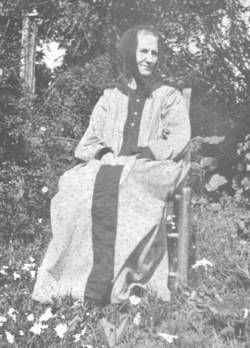 He and Mary Magdalene Sands had just been married a couple of years and had one daughter, Ida Sexton Skipper. Ida was only two months old. Ida was born in St Vincent but the family now was back in McLaren Township in residence #7. St. Vincent was just a couple of miles west of the Dave Skipper home. When you add up all the grandchildren, you get nineteen ranging in ages from three little babies up to two eleven-year-olds. Add to that nine children, four sons-in-law and a daughter-in-law, grandma, and Dave and Kate and you'd have a mighty big family get-together. Louisa's sons, James and John, lived in Conway County in 1900. G.W. had died and his children were living with John. If four of Louisa's children were still living at the time of the census, the other two must have been two remaining daughters. A Skipper girl nick-named "Deed" had married a Rentfro man but there is a discrepancy in the available information. Skipper family information indicates that the youngest daughter was called Deed. Rentfro family information about the marriage indicates that the woman named Deed would have been one of the older daughters. There is a five to ten year discrepancy. The Skipper information indicates that Mavan was called "Deed." She would have been 33 years old in 1900. A daughter, Mary, would have been 37 in 1900 and Louisa Jane would have been 43. The Rentfro family information says that David Rentfro and Deed Skipper had a daughter, Ellen Louise Rentfro, on October 9, 1874. Mavan would have been only eight years old then, Mary would have been 13 and Louisa Jane would have been 17. I like to think that Louisa Jane was called "Deed" and that she was the mother of Ellen Louise. Perhaps Mavan was the other living child in 1900. Dave and Mary Kate's oldest daughter, Florence, died in 1904 in childbirth at the age of 34. Dave died in 1909 at the age of 60. His mother, Louisa, had probably died by that time; there is no record of her in 1910. Mary Kate moved in with my grandfather, Jim and his new wife and child. Mary Kate died in 1914 and there was a dispute over the property. Jim, his wife, and two children moved to England, Arkansas in 1917. Carl Toby moved there soon after that. Dave and Kate's two youngest daughters moved to Oklahoma. Lou and Alfred Treece moved to Jonesboro, Arkansas. Harriet died in 918 at the age of 45. John Quincy's wife also died that year. That left John Quincy and his children; his sister, Betty Cowan, and her family; and Harriet's husband and family in Conway County. John's cousins, Napoleon, Ira, Ora, and Hobart Skipper seem to have stayed in Conway County also. 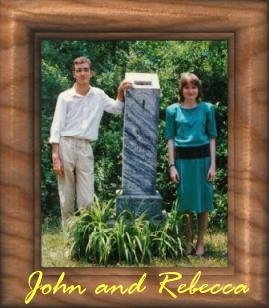 The photo on the right (courtesy of Jan Porterfield) shows Mary Catherine in her later years.The framed photo on the left shows two of their great, great grandchildren, John Luther and Rebecca Louise Skipper, standing beside Dave's tombstone. The photo was taken about 1988. The story continues with James A. Skipper, Sr. who was 27 the year Dave died. James was postmaster of Solgahachia, Arkansas, from 1908 to 1912. The James Skipper family moved to England, Arkansas, about three years after his mother died. He was postmaster at England into the 1930’s. His wife Josephine had a used clothing and shoe repair business that she managed for several years. Return to the Site Index and select the James A. Skipper, Sr. story.